Tamworth Borough Council is made up of ten electoral wards, each of which is represented by three councillors. Each council member is elected for a four year term and a local election is held three years out of four. 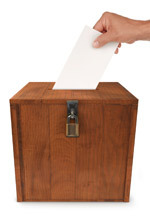 Staffordshire County Council elections are held in the fourth year. The Council is currently made up of 21 Conservative councillors, 5 Labour councillors, 1 UK Independence Party (UKIP) and 2 Independents. We also have a statutory duty to carry out polling stations reviews.